“Meow culpa.” Mourn-no-more cat lovers. Rising from the crowded cutting room floor, the canceled cat calendar that caused a church-wide hairball crisis is BACK! With your help, Forward Movement is reintroducing the popular EpiscoCat Calendar in 2018! Your GoFundMe donation will support our mission of inspiring disciples and empowering evangelists, one Jesus Meow-vement feline at a time. As a thank you, all donors will receive gifts to support daily spiritual practices. Gifts will ship in September. Donations of $25 or more will receive one copy of the calendar to keep, and one to share. Donate now to help make our church cat…holic again! Forward Movement will also accept photo submissions to be included in the Episcocat Calendar through May 2017 (guidelines below). Please note, a donation does not guarantee that your photo will be selected for the calendar. 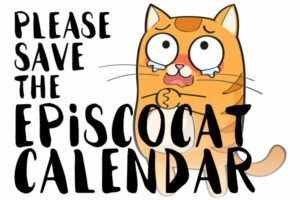 The EpiscoCat calendar is a collaboration between faithful readers, their beloved cats, and Forward Movement. This thirteen-month calendar (December 2017-December 2018) includes all the major feasts of the Episcopal Church, color-coded to coordinate with the liturgical seasons. Photos of esteemed felines from around the church—along with humorous captions—make this unique calendar a perfect gift for the Episcopal cat lover in the office, at home, or for yourself. Send Us Your Cat Photos! Forward Movement is accepting photo submissions for the EpiscoCat Calendar – our 13-month, wall-hanging calendars. If we choose your photo, you’ll receive photo credit and a complimentary calendar. Images must be crisp and in focus. An interesting background and setting is encouraged. Suggested caption(s) for your photo (optional). Only photos received on or before June 2, 2017 will be considered for this year’s calendar. Check our Facebook page starting in June for daily contests to help us write photo captions for the selected cat photos. If your caption is selected for print, you’ll receive a calendar as a thank you.